We have been having a really weird spring this year as most everyone is. It has rained for the last 8 - 10 days and absolutely no sun. I need sun just to function most days so the last few days have been a challenge. And - picture taking has been out of the question for nearly the whole of spring. Yesterday we had a bit of sun so I took advantage and took some shots of my latest project. Isn't it absolutely adorable.... 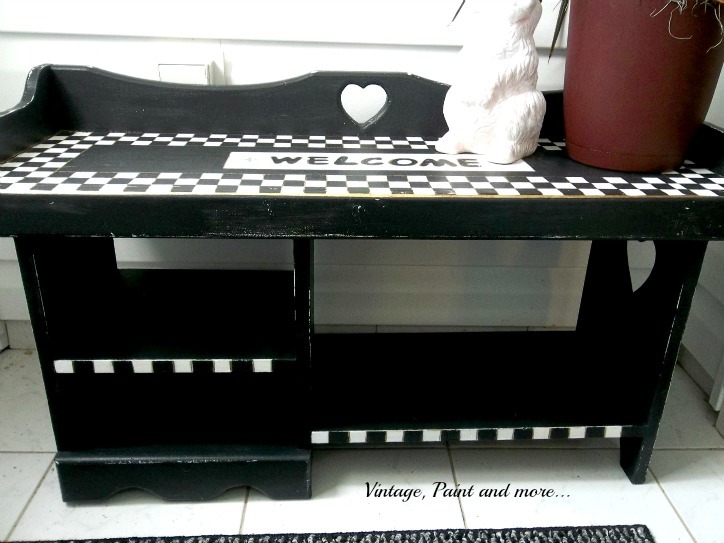 I love this-even though it is not my usual furniture transformation. I thought I had a before pic but, alas - it is not to be found. It was just plain white.This little bench has been in our household for several years now. We have used it everywhere. But, my latest idea was that we needed something in our empty foyer to dress it up a bit. And thus, the little "Welcome Bench" was painted. This is a look at the front. I got the idea from Mackenzie Child's style of furniture Her style is so whimsical and I fell in love with it the minute I checked it out. 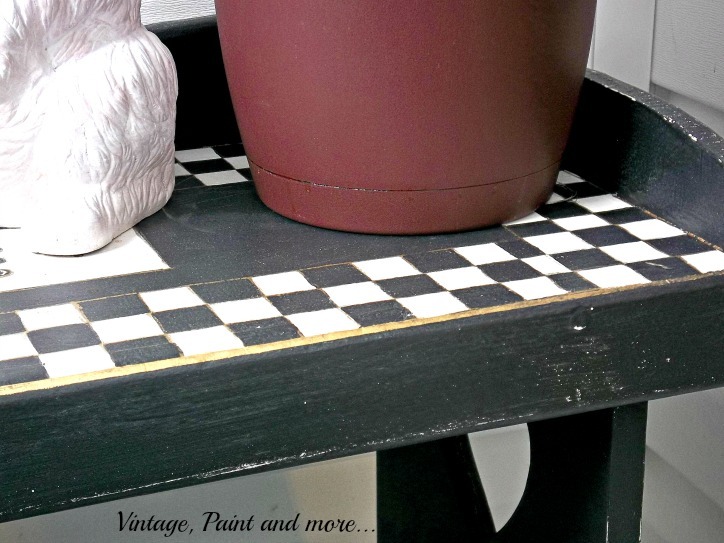 I painted it with black chalkboard paint and homemade white chalk paint made from Valspar's Anthem white. I used painters tape to mark off all the rows for the checks. 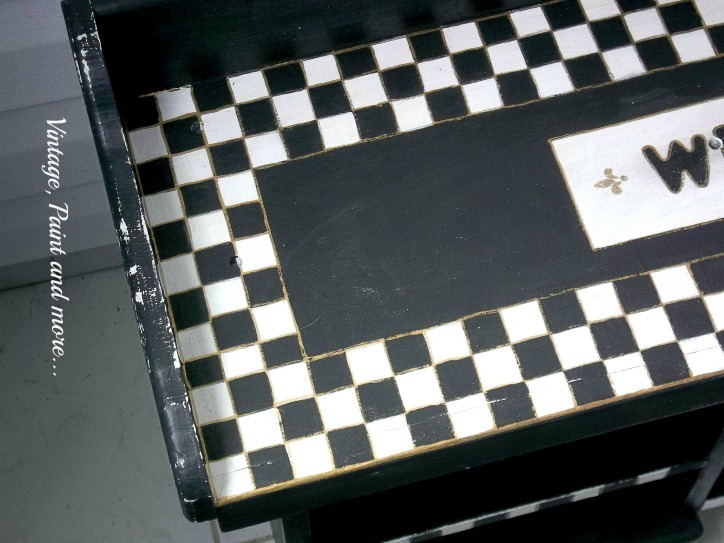 Then I placed an "x" in each box that would be painted black. I did this so I wouldn't get mixed up while painting and paint two black ones side by side. I have been known to do that. It took me a while to paint all those little squares and a while longer to touch up the white. Then I used a gold paint pen to outline all the squares to set them off. 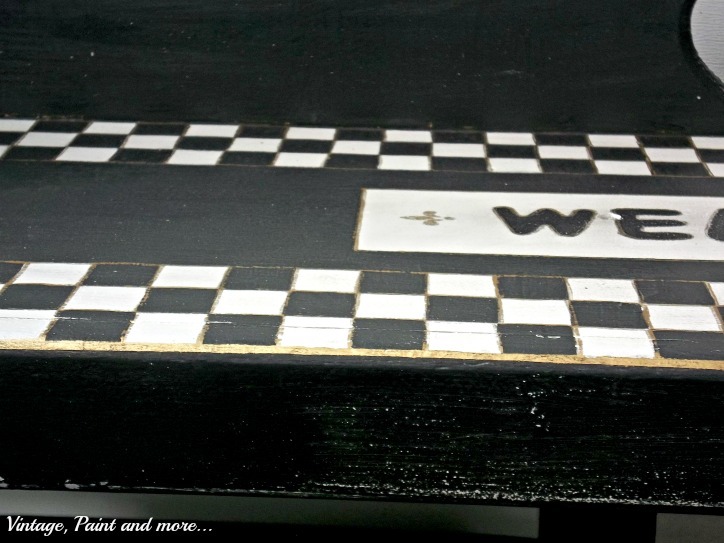 The welcome was traced with a stencil, then painted, then outlined with the gold paint pen. Even as hard as I tried some of my lines just weren't straight. So the only thing I could think of to do was to distress it. I love distressed furniture everywhere except in my house. I want the clean, crisp look of brand new so I rarely distress anything I am going to use myself. But, this screamed distressing. So I took sandpaper to it and distressed lightly. You can tell here that the distressing is not done heavily. Then I waxed it with Johnson's Paste Wax and buffed it when it was dry. I painted a terra cotta bunny that was left here by previous resident with my homemade white chalk paint and picked up a palm to sit on the bench. The rug come from Wal-Mart - only $12. I think it goes perfect with the bench. To fill that empty space right above the bench I am working on an old mirror (also left here by previous resident). I am making it into a chalkboard with the same sort of whimsical painting as the bench. The entryway looks so much nicer now no longer is it a blah empty space when you come to the front door- but fun and whimsical. Do you like your furniture distressed or crisp like me? What about whimsical furniture - is there room in your home for a piece or two to just mix it up a bit and make conversation pieces? Until next time - have fun making something you love. What a darling bench. I love the black and white and the checks. So fresh and pretty. Hope you get some sunshine soon. Thanks for the smile. So glad you joined us this week at Transformed Tuesday. 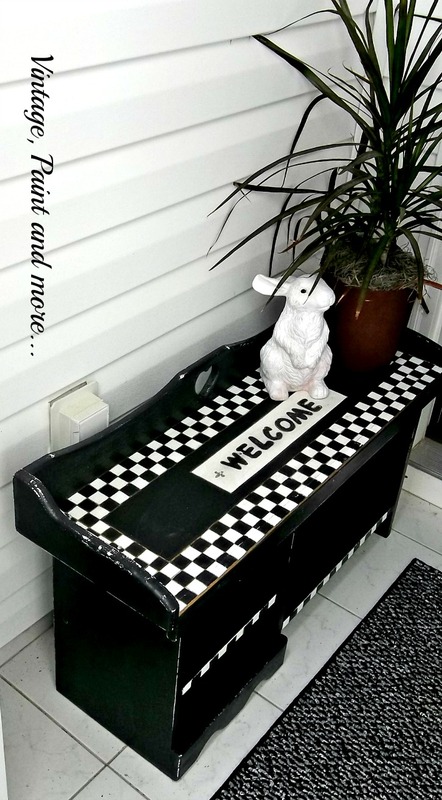 I love this little bench; absolutely perfect for an entryway!